Welcome to Elf Island Forums.com! We are the first Elf Island Forums community & fansite for the online game Elf Island. If you sign up to our forum it enables you to discuss many topics with other people from around the world. Once registered you can then reply to topics or make new topics of your own! Topics such as item trades, news discussion, and more. With all of this discussion, please remember that this site is G-Rated. Anything that is posted against our Site Rules will be removed. Founders Award - If you sign up on this site before Elf Island's beta period opens you will recieve the Elf Island Forums Founders award. » What does your VMK & Elf Island Name mean? » Forum Switch - Feedback Needed! » 9/8 - Tina's Trivia Week 5! » VMK Disney Online Game for Japan, it's Cute!!! » ToonTown Disney Code not Working? Forum Switch - Feedback Needed! 9/3 - Elf Island Trailer! Look for Elf Island to open to the public next month! More Details Coming Soon! 9/4/08- Signature and Spam Reminder! A signature is an area before your post that you can include an image or text. To edit your signature go to Profile and look for Signature. 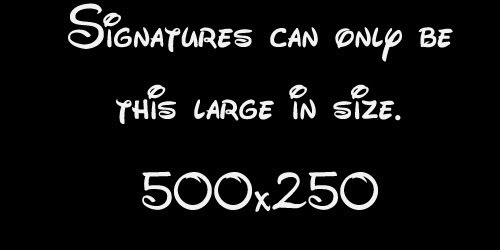 Signatures can be no larger then 500x250 (pixels) including the image and text and no larger then 255 characters. Any signature over these limits will be removed. ALL staff has the right to remove any signature if this rule is broken. Remember all signatures that is bigger then 500x250 WILL be removed from an Admin. If you have any questions please PM a Member of our Moderation Team. Over the next week you might see some odd changes to the site. This is normal. We are running tests with different things around the website. Elf Mods (Moderators) are hand picked by Head Elves (Admins). If you ever want to be noticed for a position as site staff make sure you report posts (using Report Post feature), follow all Rules and Guidelines, and overall be a good member with a good attitude. We will COME TO YOU if you show the qualities shown inside that rule. The only reason why this is being posted (again) is that we have seen a growing number of requests. Once again, we love that you want to be a site staff. We do not hire because of requests at all. Show yourself worthy - and you might end up with a green name! 7/25 - Elf Island Pre-Registration is LIVE! Elf Island Pre-Registration is Live! Who’s ready to set sail for Elf Island! The first boats to Elf Island are departing shortly! To reserve your spot on the island, pre-register now! For those who are lucky enough to reserve a spot and pre-register, you will get a cool Founder’s hat for your elf and early access to our virtual world - Coming soon! After registering your username and pass code, be sure to regularly follow the Elf Island blog for important updates. Our launch date is quickly approaching us! We look forward to seeing you on the Island very soon! If you have already pre-registered using our special form for VMKers, you do not need to register again. Parental consent will be required before you can enter Elf Island. Elf Island Forums is not associated and/or affiliated with Elf Island, the Good Egg Studios, or the Walt Disney Company.